Prepare the pörkölt as usual, only cut the meat into slightly smaller cubes. While it cooks, clean the rice and wash in a strainer. Mix in with the meat when tender, add about 2 cups of boiling water and a dash of salt and ground pepper. Bring to a boil and turn the heat down. Cook for about 15 minutes, covered, during this time the rice will soak up the water. Pull to the side. Wrap the lid in a clean dish cloth, place on the pot again and let it sit for 15 minutes. This will prevent the steam from escaping the pot and trap it in the pot to further soften the rice. 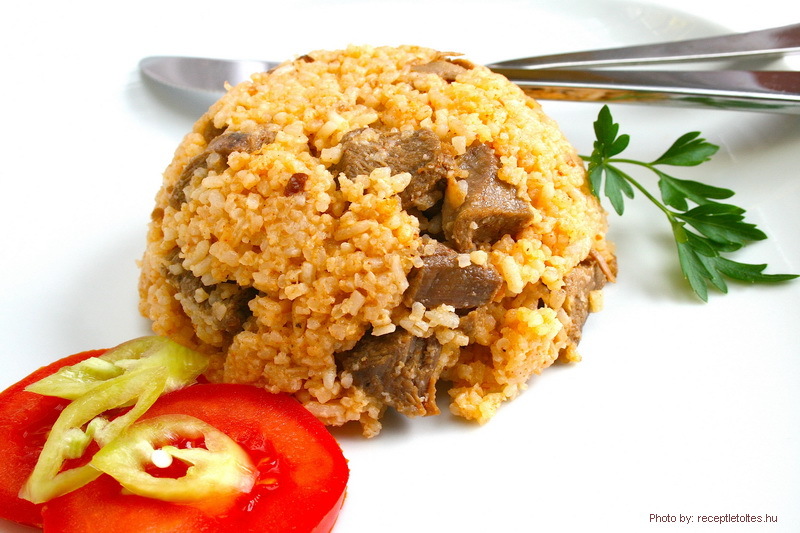 – Another way to prepare this dish is to cook the rice separately from the meat and then mix the two together at the end. – When using wild rice, soak it in cold water for 1-2 hours (unless pre-cooked) to fasten its softening. – We assume that before adding the 1 1/2 cups of water the meat contains about 3 oz of sauce (1 1/2 oz of water). If that were more, reduce the amount of water added, if less then increase it. not, however, freeze the meat-rice mixture.